Moneyball is a rare sports film that bucks the traditional conventions of sports movies. It amazingly doesn’t end with an epic home run to win the big game. And even more rare is a baseball movie that doesn’t wax nostalgic about the smell of the grass and the crack of the bat, blah, blah, blah. Moneyball is a different kind of sports movie, and broadly well done at that. 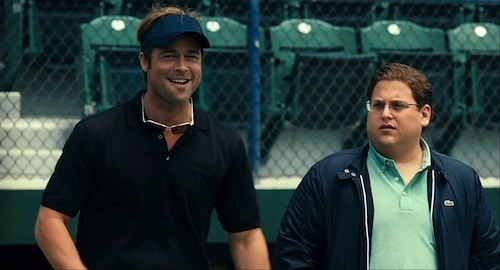 At the center of the film is real life baseball G.M, Billy Beane, played by Brad Pitt. Faced with a fraction of the budget that other teams have, he is determined to find a different way to assemble a winning team. Enter Peter Brand, played by Jonah Hill. Brand, a young, shy Ivy League brainiac, uses statistics and complex algorithims to find under-valued players. Together they assemble an “island of misfits” that end up blending into a winning team. The best part of this film is the performances of Pitt and Hill. Pitt’s performance is utterly believable, bringing to life a character who is both publicly confident and privately conflicted. Hill’s portrayal of Peter Brand is nothing less than stunning. He is understated and wonderful in an awkward way – he may be the least “sporty” guy to ever star in a sports movie. And ultimately, this movie is at its best when Pitt and Hill are on the screen together. The film is not perfect. The flashback scenes of Beane as a player are a tad tedious. And the film somewhat crawls a bit too slowly towards its end. But in the end, this is a fine film, and one that could see its share of Oscar nominations. At the top of the list will be Pitt and Hill. Cheap North Face Jackets For Women,North Face Clearance 65% Off! Moncler Nantes Dame Lang Dunjakker Bl?